Boulder County, Colo. - On Thursday, Feb. 22, the Boulder County Commissioners announced the recipients of 2018 environmental Sustainability Grants in the following communities in Boulder County: Boulder, Erie, Jamestown, Lafayette, Longmont, Louisville, Lyons, Nederland, and Ward. Boulder County’s Environmental Sustainability Matching Grant Program will help the county leverage community resources for a coordinated, county-wide approach to environmental sustainability. The 2018 Sustainability Grant recipients are pursuing diverse projects, including public engagement on community renewable energy goals, public transit incentives and education, workforce development in underserved communities to save energy, outdoor water conservation, and resilient local food projects. The Sustainability Matching Grant Program was established in 2014 as a way to support efforts that propel sustainability priorities in Boulder County communities. Any municipality located within Boulder County that could provide match for their request was eligible to apply for up to $15,000. City of Boulder proposed funding of $15,000 to develop an ecological assessment and implementation plan. The proposed project will support a more integrated municipal ecosystem management strategy and help prepare the community to adapt to climate change impacts on ecosystems. Town of Erie proposed funding of $14,000 to offer water conservation services and incentives to residents and businesses, such as outdoor water audits, xeriscaping, and water conservation seminars, in partnership with Resource Central. The project aims to conserve water and meet the conservation goals set by the Town’s Water Conservation Plan. Town of Jamestown proposed funding of $3,995 to divert waste from the landfill through a monthly community collection of recyclables, and community zero waste education. The project will help divert materials from the landfill and conserve raw materials. City of Lafayette proposed funding of $15,000 to support community engagement to achieve the community’s renewable energy goal and to incentivize and educate community members on public transit. The project aims to increase community and stakeholder involvement, increase public transportation access for all, reduce greenhouse gas emissions, and improve air quality. City of Longmont proposed funding of $15,000 to train low income residents on the installation of efficient energy and water fixtures and to increase the efficiency of homes through this pilot project. In partnership with CU Boulder, the project provides workforce development opportunities to underserved communities and seeks to reduce greenhouse gas emissions and reduce utility bill costs. environmental health, economic vitality, and community well-being. Town of Lyons proposed funding of $15,000 to continue to support a part-time sustainability coordinator to implement recommendations identified in the Lyons Environmental Sustainability Action Plan (LESAP), help administer existing programs, and measure environmental impacts. Benefits include reduced greenhouse gas emissions, cleaner air, and waste reduction. Town of Ward proposed funding of $15,000 to continue efforts to increase local food security and resiliency and to provide stipends for community project coordinators. The Ward community aims to achieve long term resiliency and self-reliance though food security. 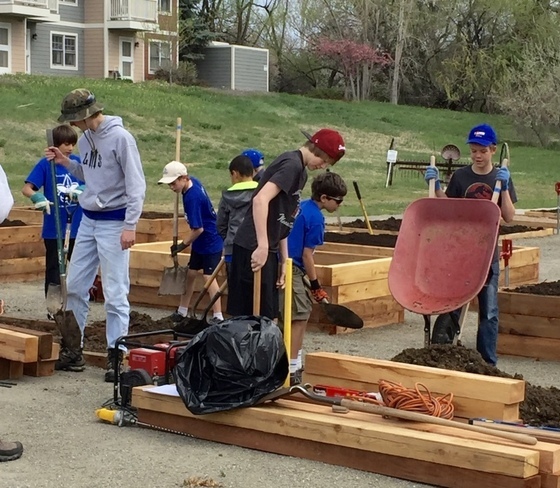 Boulder County is proud to have so many communities with progressive ideas for sustainability, and the county looks forward to seeing these grant-winning projects come to fruition. For more information about Boulder County’s sustainability mission and to learn about other programs, visit www.BoulderCountySustainability.org. Lousiville community members helping to build a community garden in 2016 that was partially funded by a Sustainability Matching Grant.